Native to San Diego County, Donna Walker earned her AIS Certificate (American Indian Studies) from Palomar College in San Marcos, CA where she also majored in art and history. Donna is a contract artist and teacher in archaeological illustrations. She has taught students from various colleges and at the San Diego Archaeology Center in Escondido, the IPAI Center in Poway, and the Colorado Desert Archaeology Society in Borrego Springs, CA. Her work appears in professional archaeological reports and presentations. She can be reached by email at: donna.walker05@gmail.com to schedule a class or one-on-one lesson. August of 2017, I was asked by Simon Breen, Education Manager of The Escondido Creek Conservancy (TECH), to help with a new exhibit at the Elfin Forest Interpretive Center in Escondido, CA. I currently lead nature walks there once a month (Second Sunday at 10 am – just in case you’d like to join me!). First People of the Escondido Creek Watershed Exhibit on display through December 31, 2017. Artwork by Donna Walker; artifacts of the area on loan by SDAC – San Diego Archaeological Center. You’ve heard the saying, “It takes a village. …” that’s exactly what it took for this exhibit…Simon said he wanted it to be ready in one month! Artwork of stone tools with descriptions created by Donna Walker. * Everyone had their part; from Park Rangers, Jeff, Shawnn, and John, Tim Roberts and Victoria Grau, interns for the exhibit. Members of the Luiseño People, Mel Vernon and Diania Caudell for their input and expertise and for Diania’s cool basket weaving class! Nathan Serrato and Simon Breen for coordinating the exhibit and reception. Last but not least, yours truly for the illustrations, signage, and coordination of the artifacts on loan from SDAC (San Diego Archaeological Center) of Escondido, CA. After meeting with Simon and Mel, the three of us came up with a name for the exhibit: “The First Peoples of the Escondido Creek Watershed.” We felt it was important that the exhibit focus on Native Americans both past and present, the Kumeyaay and Luiseño Peoples. In designing the exhibit, it was essential to display artifacts found in Escondido and show how indigenous people lived during prehistoric times. However, we also wanted celebrate their culture and continued contributions to the community in present day. First thing I did was call up SDAC to speak with my friend and curator, Adolfo (Ad) Muniz. He was very helpful in choosing artifacts found locally to loan us for the exhibit. Ad also spoke at the reception on how stone tools were made and about archaeology of the area. SDAC’s Adolfo Muniz, giving a talk on the archaeology of Escondido; and Basket Weaver, Diania Caudell (Luiseño), teaching basketry at the exhibit’s reception. To represent both past and present, I pulled together, from my own “contemporary artifacts,” a group of stone tools, knives, bone awls, and jewelry made from acorns and Juncus. A big thanks to the San Diego Archaeological Center for loaning the artifacts in our exhibit! Rangers Shawnn and John balancing the Olla. Display cases were made out of Plexiglas by volunteers and rangers; the artifacts from SDAC fit perfectly in their respective cases. Thanks to Jeff Swenerton for making little wood accessories to set some of the smaller artifacts, like the bird darts, up high for easier visibility. We sent the taxidermy duck to a new home while the Olla took its place in the exhibit. It took Rangers John, and Shawnn to balance the Olla on some museum wax to keep it from wobbling! This exhibit was interactive for both children and adults. It’s highlights were the lifestyles and customs of the Luiseño and Kumeyaay. 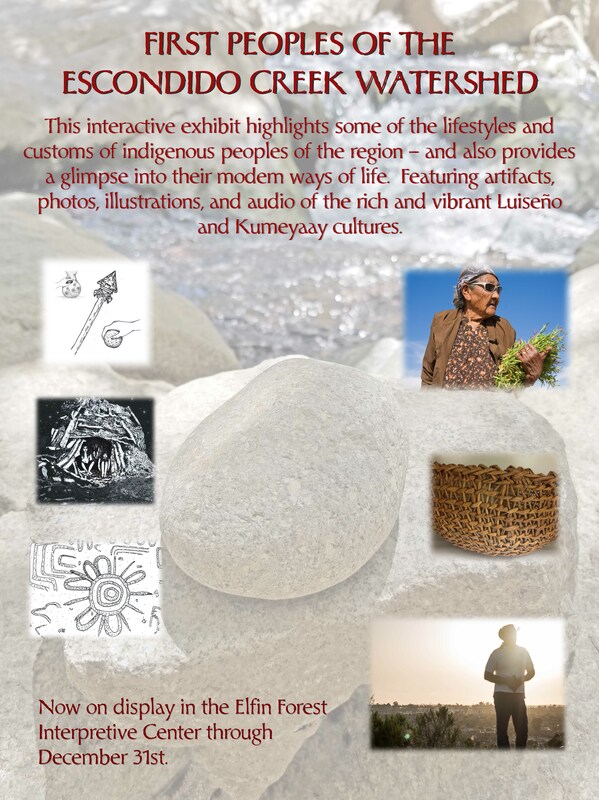 Featured items were of artifacts and contemporary pieces, photos, illustrations, audio sound bites of the Luiseño and Kumeyaay cultures, and interpretive maps of Escondido Creek. Visitors were able to listen to words in Luiseño and Kumeyaay via their smart phone – thanks to Victoria’s task of recording voices from the Luiseño and Kumeyaay representatives. Children got to shake rattles made from gourd, hold baskets from the willow tree, and sandals made from the yucca plant. Tim created great interpretive maps of the region outlining important features and sites. Contemporary pieces made by local Flintknappers, and Native Americans. Contemporary pieces on display consisted of pottery created by Kumeyaay Martha Rodriguez. I had purchased an Olla from her at a pottery making demonstration held at an Arch in the Park event a few years back. There were earrings made from Juncus and Coast Live Oak acorns, knives of flaked stone, bone awls, etc. Baskets for display were provided by Diania Caudell. Close-up of artifact illustration signs. “Donna Walker, one of the Conservancy’s longtime volunteers, started off the day with a nature walk. She led the group along the creek trail and introduced some of the historical uses of our native plants. After the walk, Adolfo Muniz from the San Diego Archaeological Center provided some insight into the artifacts chosen for the exhibit. And lastly, all of our visitors got a hands-on demonstration on some traditional basket weaving methods thanks to Diania Caudell. Everyone was able to make their own basket using the single-twine method. Kumeyaay representative Elie Keim of the San Pasqual Cultural Center (she contributed info about the Kumeyaay and also loaned out some items such as the yucca sandals and the rattles). [Elie is now borrowing several pieces of this exhibit and plans to display them at the San Pasqual Cultural Center]. Deborah Small also gave us permission to use some of her images. Stan Rodriguez (Kumeyaay) lent his voice to the project as well (he provided Kumeyaay translations). Mark Farris (Luiseño) loaned a basket. Fast Forward to January 2018 – The First Peoples Exhibit will be displayed again, for the public to enjoy, once we find a permanent home for it!